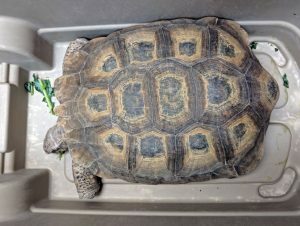 Every spring and fall, Friends of Red Rock Canyon Tortoise Habitat Volunteers weigh and measure the shells of the tortoises in the enclosures behind the Visitor Center. Hugo was his normal, feisty self all summer but at the end of September volunteers discovered that he had lost some weight since they took his measurements in the spring. I decided that a check-up was in order, just to make sure Hugo was healthy before going into brumation for the winter. On October 5 Hugo took a trip to his wonderful veterinarian at Lone Mountain Animal Hospital. She took x-rays to look for bladder stones, performed a complete blood panel, and a bile acids test to check Hugo’s liver function. He never enjoys being put into his large bin, but despite that he munched on the bribery kale that I offered. Snacking on some bribery kale. 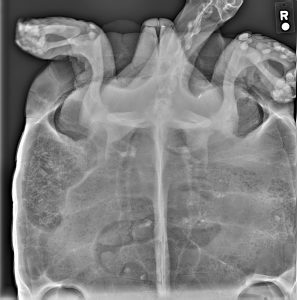 The x-rays showed no bladder stones, which are frequently a problem in tortoises, so that was excellent news! All of his blood work and the bile acids test looked good as well, but his CPK (creatine phosphokinase) levels were elevated. 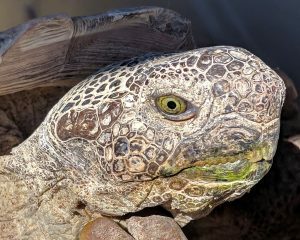 This can happen in reptiles simply from the stress of going to the vet and being handled. 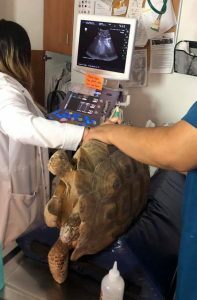 Hugo’s veterinarian recommended an ultrasound, however, just to be safe. Hugo is so large that his whole body couldn’t fit in one x-ray! That meant another trip to the vet, and this time Hugo was on to me. The first time I stopped by to bring him back to the vet, he was outside his burrow. However, by the time I’d gotten his bin, he had scurried several feet back into his burrow. No luck that day! I checked again the next day, but due to the chill in the air he was still inside. I finally had luck the third day, October 12, when he was basking near the wall of his enclosure. Back to the vet we went! The ultrasound was taken through his plastron, which is the underside of the shell. Hugo didn’t enjoy his ultrasound, but the doctor and techs were very gentle and careful with him. Thankfully, all his insides looked normal and healthy. I’m very happy that Hugo can go into brumation with a clean bill of health, and I’m sure Hugo is pleased that he won’t be going back to the vet for a while! Aah, back to his normal routine! He even has a kale mustache.